This week campers made Molas from Columbia with construction paper as they cut out animal shapes. They also created masks for Carnivale. Campers decorated autograph books to share with their new and old friends from D-E this summer. Campers looked at Adinkra patterns from West Africa. They made their own in watercolor resist. Then they drew African animals and reptiles in bright colors on black paper which they pasted on their background. 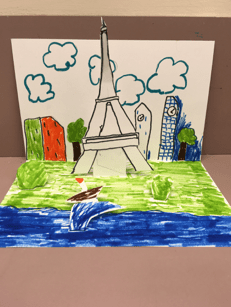 This week in art, our Adventures campers looked at famous European landmarks and figured out their shapes. They made pop ups of castles, the Leaning Tower of Pisa, the Eiffel Tower, St. Basil’s Cathedral, Big Ben, the Parthenon, and the Coliseum. 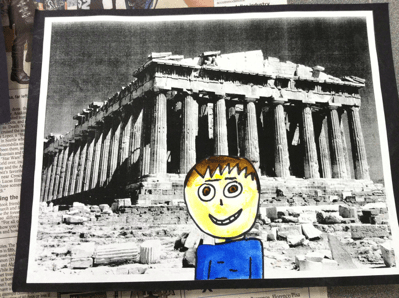 They also created self-portraits in front of these iconic landmarks. Discoveries campers made a Medieval castle play-set, including a castle, characters to live in the castle, animals to live outside, a horse, and a dragon. Aside from having a lot of fun expressing themselves creatively, the children are developing skills and gaining confidence in their abilities in STEM projects. A common theme in all these artistic endeavors is how the children are developing fine motor skills! Campers are learning and practicing proper pincer grip, cutting techniques with scissors, hand-eye coordination in wrapping cylindrical objects and placing tape and yarn in strategic paces. They are also exposed to age-appropriate engineering and math concepts. For instance, they learn how a simple 2D shape can turn into a 3D shape and experience perpendicular and parallel structure. They also learn mechanics in the creation of a functional drawbridge as well as measuring by determining appropriate sizes and lengths of chosen materials. Campers had a blast this week learning about Australia! We learned about the native Australians, the Aborigines, and created traditional dot paintings and rain sticks. Campers also learned about the many types of animals in Australia and made Frilled Lizards, step-by-step Koala drawings, and Kookaburras. Campers made art journals with collage on Monday. They are encouraged to draw whatever they wish inside and practice drawing animals. They will take their journals home on their last day of camp. We also created hands across America in watercolor resist. Campers partnered with their new and old friends to draw each other’s hands. They learned about warm and cool colors using lines and patterns. Mexico. These are cut paper flags to celebrate different holidays. Artistic Pop-Ups & Autograph Books! During the week of August 8, Adventures campers will make popups of the summer Olympics, as well as geometric and organic shapes using warm and cool colors with tissue paper! After completing their artwork, Adventurers will create autograph books so we will remember all of our friends made this Summer 2016 at Summer Connections! During the week of August 1, Adventures campers will learn about artistic shape and movement, inspired by a Matisse collage. Additionally campers will learn to manipulate clay and make their own Olympic “gold medals”! During the week of July 25, Adventures campers will take a “walk on the wild side” and explore the five continents through learning about animals on those continents, including making animal collage shadow puppets. We will also look forward to creating animal silhouettes and patterns by painting in the style of Australian Aboriginal art! During the week of July 11 as part of our ongoing Olympics theme, our Adventures campers will learn about Greek-inspired shapes and patterns, including making their very own Greek urns with scratch art! Campers will learn about pattern and color. We will make a painting based on Romero Britto, a Brazilian pop artist and ambassador to the Olympics. Some campers will also make a Brazilian Carnivale mask! Campers will learn about line, shape, color and symbols in art. They will create an Olympics ring poster with printmaking techniques and paint. They will also make an art journal; which they will work on the weeks they are here. They will be using washable paint the first two weeks they are here. Make sure they are wearing suitable clothing.